Carlton, AKA Alfonso Ribeiro, has a bone to pick with Fortnite, and it has to do with one of the game's dances. If you're unfamiliar with the game, then it's almost impossible to explain just what the premise is. The aesthetic, the combat, the whimsical nature of the Battle Royale mechanics that the game employs, Fortnite is one of those titles that makes people who don't play it inexplicably angry. And then, there are the dances. For whatever reason, you can make your on-screen avatar initiate dance moves, mid-combat. I don't know why people find it so enjoyable, but they do. 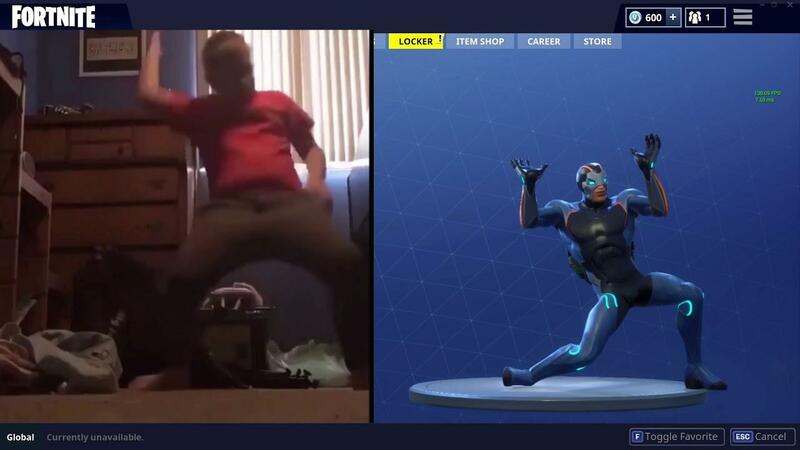 So much so that people begin imitating the dances in real life, or submit their own to the creators of the game, who then go and implement them. Like the beloved "orange justice". The game has a bunch of dances creators made specifically for the title, but they've also coded in some jigs that were clearly inspired by — or straight-up stolen from — characters from popular movies and TV shows. Like Carlton's "It's Not Unusual" dance that he came up with on The Fresh Prince of Bel-Air. The wonderfully so-awkward-it's-actually-great routine was devised by Alfonso Ribeiro and has blatantly been coded into the game. Alfonso brought the dance back to Dancing With the Stars when he absolutely crushed it with this Carlton-inspired routine. 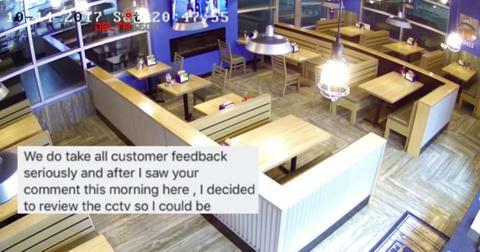 Many people are now using footage from the show and juxtaposing it with screen recordings from the game to highlight the obvious similarities between the two. 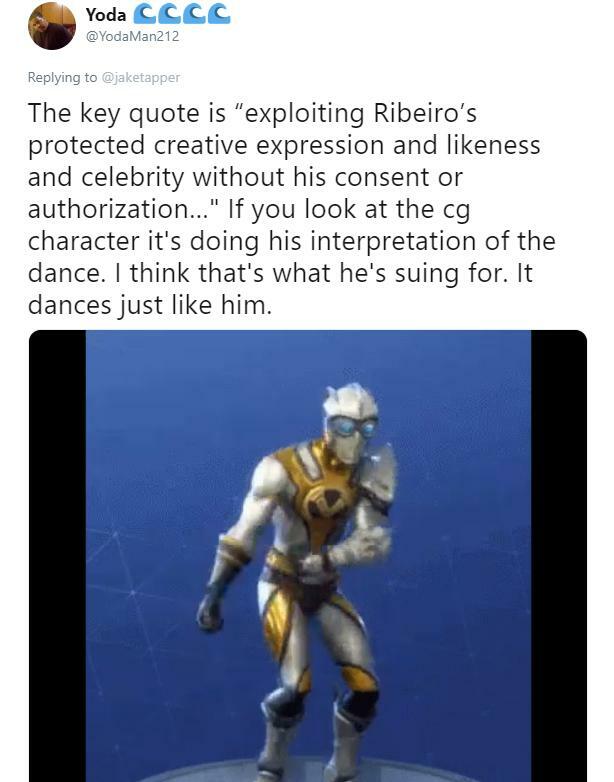 Apparently, the Fortnite creators weren't keen on reaching out to Ribeiro to find out whether or not they could use the dance in the game, or maybe they just didn't think that they had to and that there's no way a person could trademark a dance. And that's rubbed the Fresh Prince actor the wrong way. 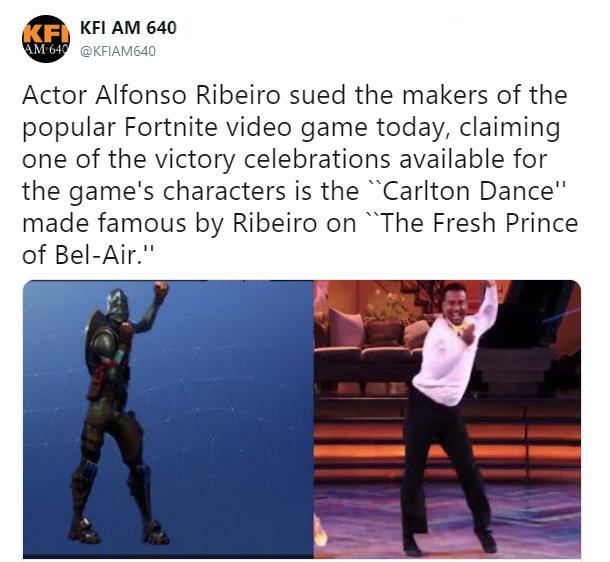 Because he's decided to sue them for damages, claiming the game-makers are "exploiting Ribeiro’s protected creative expression and likeness and celebrity without his consent or authorization…"
Can Fortnite be sued for stealing dances? It seems that the legalities surrounding dances are intellectual or creative property are the same as applied to images, photo, video, or audio. 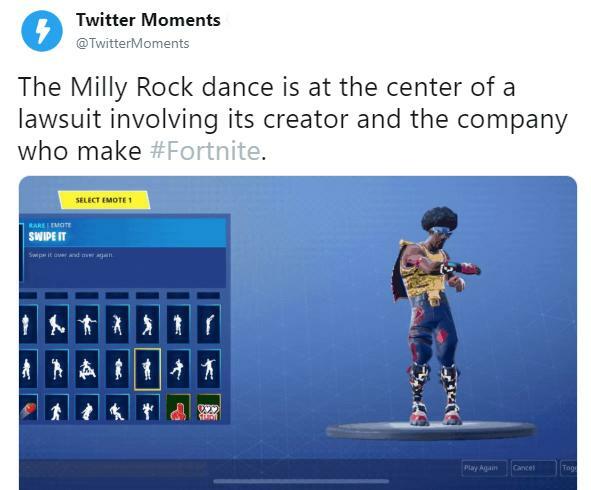 But that hasn't stopped a growing number of people and artists from seeking damages from the game's creators for pilfering their sweet, sweet moves. If you're wondering what all of the fuss is about surrounding the dances and why people are so up in arms, then you probably don't know that people specifically pay money, digital currency, in order to buy these "e-motes." While I personally never got on board with exchanging real money for some digital tomfoolery like a character costume or little dance or weapon upgrades (call me old-school but I liked video games better when the richest kid on the block couldn't just blow you out of the water without being skilled) there are tons of people who do. 2 Milly's "Swipe It" dance, for example, was part of the game and could be unlocked just by playing. But soon developers removed that option and if you wanted the ability to e-mote the popular dance, then you'd have to shell out cash for it. Developers also included his 2014 "Milly Rock" dance from the song of the same name. 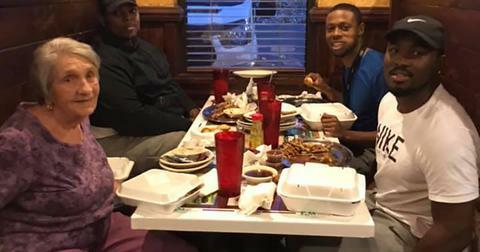 2 Milly is one of the most vocal critics of the game and its stealing of dance moves, but there are others who pointed out that the cash-cow of a game is ripping off their steps. Snoop Dogg and Donald Faison are also angry the game's creators didn't seek permission to implement their moves before putting them in the game. 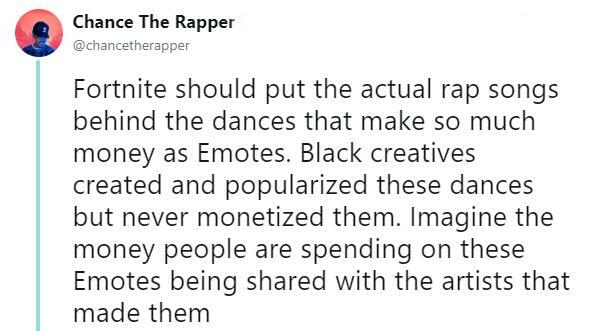 Chance the Rapper also called the practice exploitative of young artists, and pointed out that the game's creators are making a ton of money from selling e-motes and they should at least consider profit-sharing the sales of the e-motes with the artists that created the steps. 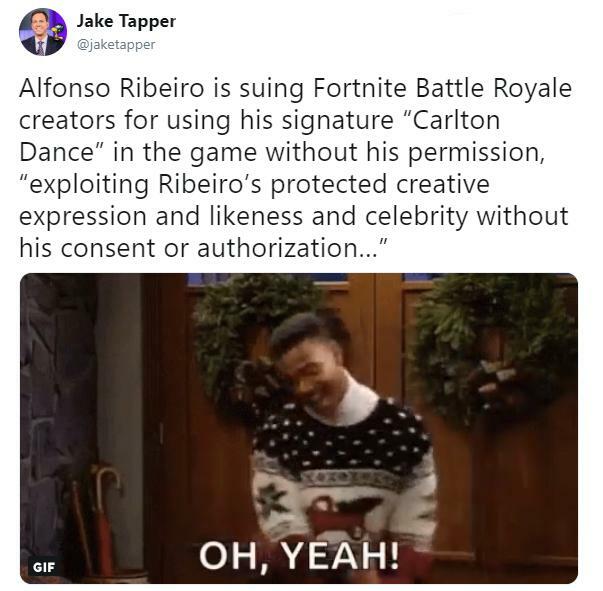 There's a lot of talk surrounding the lawsuits and, depending on the judge's ruling for Carlton's dance-woes, there could be a bunch of new legal precedents set for not just creative property and licensing laws for dancers, but new stipulations for the digital media and video game worlds as well. Fortnite uses a lot of "signature" dances. 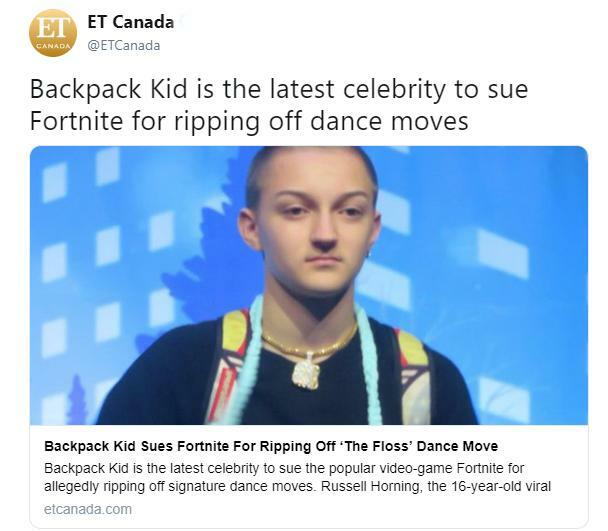 I can think of a couple of video games from my youth that would get absolutely destroyed by lawsuits if a dance like this was passed. The creators of Revenge of Shinobi, if they're still in business, could be in a world of trouble. Or the Metal Gear Series for basically combining Clint Eastwood and Kurt Russell into the same person. Heck, maybe even Sergio Leone's estate could sue Konami for basically turning A Fistful of Dollars into a video game.